Chevrolet sales were the month's best since 2006, up 8.7 per cent over the same month a year ago. Automakers sold 187,266 new vehicles in Canada in September, good for a 7.7 per cent increase from the same month last year. Ford retook the top spot from General Motors with 30,881 sales in the month compared with GM's 27,237 units sold, putting Ford about 14,000 units ahead of its chief rival for total sales so far this year. Ford, Nissan, Toyota and Honda all posted record September sales. Many brands with a smaller footprint in Canada saw double-digit sales gains in September, including a 50.5 per cent increase for Volkswagen and an 11.1 per cent increase for Subaru. The industry is on track to top a record two million sales for the entire year. Nissan Canada had its best September on record, selling 13,437 vehicles, up 14.3 per cent, and surpassing the 100,000 annual sales mark sooner than ever before. The Nissan division also set a September sales record with 12,215 vehicles sold, an increase of 14.4 per cent. Infiniti also set a September sales record with 1,222 units sold, an increase of 13.6 per cent. 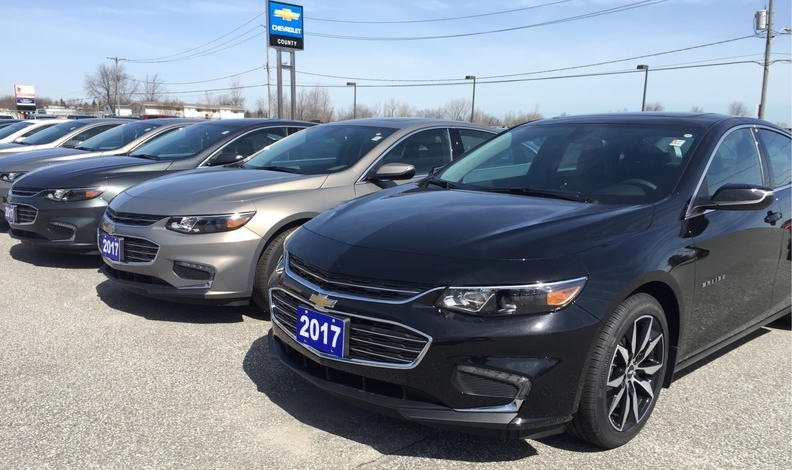 The automaker has now sold 114,324 vehicles through the first nine months of 2017. In 2016, the company didn’t reach the 100,000 threshold until October. While sales of the popular Nissan rogue utility vehicle were down 3.2 per cent to 3,712 units, it remained the automaker’s top seller. But the new, smaller Nissan Qashqai compact SUV was the automaker’s second-best seller with 1,553 units sold. Meanwhile, Murano and Pathfinder sales were up 17.1 and 21.8 per cent, respectively. Infiniti’s top seller in September was the QX60 with 525 sold, up 63 per cent. Honda also had a record September, selling 18,181 vehicles, good for a three per cent increase over last year’s September sales. The Honda division sold a September record 16,143 vehicles, up three per cent over last year. The luxury Acura division reported September sales of 2,038 units, also up three per cent over last year. "Modest Honda gains in September can be attributed to truck growth, as strong demand pushed both CR-V and Pilot to monthly sales records,” Jean Marc Leclerc, Honda Canada’s senior vice-president of sales said in a release. Ford Canada had its best September sales on record, driven by the Ford F-Series, which saw its best month on record. Ford sold 30,899 vehicles in September, up 2.4 per cent from the same month a year ago. The automaker’s total truck sales were up 3.6 per cent with 16,323 F-Series pickups leading the way. The Ford Escape SUV, with 5,259 units sold, had its best September on record, up seven per cent. General Motors Canada sold 27,237 vehicles in September, a seven per cent sales increase over the same month last year, as 2017 continues to be a strong year for the automaker. Total sales through nine months are now up 16.5 per cent over the same timeframe in 2016. Cadillac had its best September on record, up 18.8 per cent, while GMC, up 16.3 per cent, posted its best September sales total since 1999 and Chevrolet sales were the month’s best since 2006, up 8.7 per cent over the same month a year ago. John Roth, GM Canada’s vice president of sales, credits the strong sales to what he called the industry’s “newest and most diverse product lineup.” The automaker said in a statement it has been focused on retail over fleet sales this year. GM Canada didn’t immediately provide the number of vehicles sold by each brand. Toyota Canada’s sales surged 14.5 per cent to 22,018 vehicles in September. Double-digit percentage sales increases of cars, trucks and luxury vehicles helped the automaker to its best September on record. The automaker sold 11,537 trucks, up 16.5 per cent over the same month last year, and 2,419 luxury vehicles, up 11.1 per cent. The Toyota brand alone was up 16 per cent to 19,599 vehicles. Sales of the Tacoma pickup, Highlander utility vehicle and Sienna minivan were all up. The automaker’s car sales were up 12.7 per cent with the Camry and Corolla leading the way. Sales of the two sedans were up 31.1 per cent and 9.8 per cent, respectively. Subaru’s Canadian sales totalled 5,139, up 11.5 per cent compared with the same month a year ago. The automaker made gains in both the car and truck segments. Sales of the Impreza were up by 284 units, or 40.6 per cent,while Crosstrek sales were up 66.6 per cent to 1,497. Hyundai Canada’s total sales, including the Kia brand, were 19,830 in September, up 8.9 per cent over last year with Kia doing most of the heavy lifting. Kia sales were up 19.4 per cent to 7,819 vehicles last month. The Hyundai brand posted modest gains in September, up 2.6 per cent to 11,961 vehicles. But the brand remains down 8.1 per cent for the year. Fiat Chrysler Automobiles September sales were down six per cent to 18,444 as its Jeep, Chrysler and Dodge brands all struggled. Jeep sales were down 28 per cent to 4,031 vehicles, saved only by a surge in Compass sales of 548 units as the automaker continues to aggressively roll out the redesigned small SUV. Sales of every other Jeep model were down. Chrysler brand sales were down 33 per cent to 597 vehicles. The new Chrysler Pacifica minivan, which has now been on the market for more than a year, saw its sales decrease 11 per cent to 444 units. Dodge was down 10 per cent to 5,419 vehicles, with only the the Durango posting a gain, up nine per cent. Ram provided the only bright spot with a sales increase of 16 per cent to 8,136 vehicles. Ram pickup sales were up 16 per cent to 7,732 units while the ProMaster Van, used mainly by contractors, sold 357 units, up 148 per cent. FCA sold 152 Fiats and 109 Alfa Romeos in the month. For more sales results, see the chart accompanying this report.